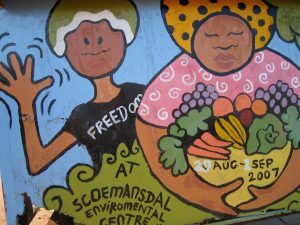 Afristar Foundation has conceptualized, designed and implemented several environmental murals on public surfaces to disseminate environmental message and call citizens to action. Afristar artist Bonita Edwards has skillfully created colorful and conscious displays to promote tree planting, urban greening, community and school gardening, as well as advertisements to greening events and environmental expositions, on everything from bus stops to bridges. Raising awareness and bringing green messages into communities, the murals become community talking pieces, attracting local attention, and bringing color and life into otherwise bland public urban spaces. Afristar murals often form part of a greater development initiative, and Bonita skillfully engages community members in the creation of the murals or art pieces, imparting valuable technical skills to local apprentices and artists-in-training. This mentoring component acts to root the mural’s message into the artists that create it, as well as train them in professional painting technique. Once the mural is complete, it is the local artists that claim ownership over the public art piece, invoking civic pride and building confidence in newly-skilled artisans. The message itself lives on, imprinting a legacy into the community and having impact far into the future.